I'd like to present to you my Symphony in C minor and I would very much appreciate your impressions - thank you! 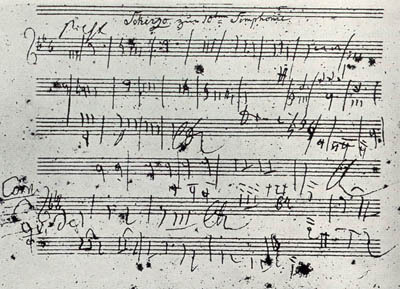 An Andante with 7 variations on the theme which Beethoven sketched for the second movement of his planned 10th symphony in 1825. Among Beethoven's sketches for a 10th symphony from 1825 there are the opening 24 measures for a Scherzo (titled 'Presto') and the 7 measure theme for a Trio as a middle part of the movement. This Scherzo theme is one of the most furious and powerful Scherzo themes I know, somewhat a mixture of the Scherzo themes of his fith symphony and Schummann's first symphony. I made an atttempt to develop these themes to a whole symphonic movement.